PETALING JAYA: Tan Sri Danny Tan Chee Sing, the substantial shareholder and group chief executive officer of Dijaya Corp Bhd, will inject 73 of his privately-held properties with a market value of RM1.1bil for approximately RM948.7mil into Dijaya Corp, making it one of the largest related party transactions in Malaysia. In a press conference yesterday, Dijaya officials said that the proposed amalgamation exercise would be satisfied by RM250mil cash and the balance via the issuance of a 10-year 2% coupon Redeemable Convertible Unsecured Loan Stocks (RCULS), with a staggered conversion price range of RM1.30 to RM2.50 over a 10-year period. There would also be a renounceable rights issue of up to 491.3 million new shares of RM1 each, which Tan has committed to take up at least RM250mil, which is also the minimum scenario of the proposed exercise. This effectively means that Tan would be injecting cash of RM250mil back into the company. The chances of Tan triggering a general offer threshold is remote as there are clauses which limit the quantity of RCULS to be converted depending on profits made by Dijaya over the next 10 years. Dijaya's renounceable rights issue of up to 491.3 million new shares of RM1.00 each is priced at an issue price of RM1.20 per rights share, together with a bonus issue of up to 122.83 million new shares of RM1 each in Dijaya. Shareholders are entitled to four rights shares for every five existing Dijaya shares held and one bonus share for every four rights shares subscribed. “These proposed acquisitions and corporate exercises will need to be approved by shareholders of Dijaya and the Securities Commission. An independent adviser with the purpose of protecting minorities, would be appointed,” said Astramina Advisory managing director Wong Muh Rong, who is also Dijaya's joint adviser for the exercise. Presently, Tan directly owns 30.5% of Dijaya, and indirectly owns 17.86% through Impeccable Ace Sdn Bhd and 18.26% through Golden Diversity Sdn Bhd. Under a maximum scenario, Tan's shareholding in the company would remain at 30.5%. Under a minimum scenario, his shareholding will increase to 42.67%. Wong said that chances of a mandatory general offer was remote, as offer letters to underwrite Dijaya's shares under a minimum scenario had already been received from RHB Bank Bhd and AmInvestment Bank Bhd. Meanwhile, the properties to be injected are a mixture of land and property investments in the Klang Valley, Penang, Johor and Sabah which would see Dijaya's landbank increase to 870 acres from 802 acres, and its total lettable area increase from 550,000 sq ft to 1.4 million sq ft. “Some of these landbank are in prime locations such as Jalan Bukit Bintang, Jalan Conlay and SS2 in the Klang Valley, and Macalister Road in Penang,” Dijaya managing director Datuk Tong Kien Onn told a press conference here. The investment properties are already tenanted out offering average yields of 8%. 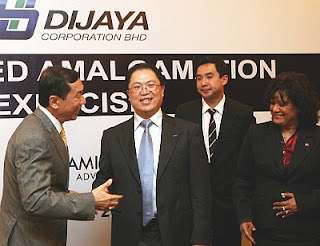 The injection of new assets would see Dijaya's gross development value (GDV) increase to RM37bil from RM30bil. Wong added that Tan had been acquiring these parcels of land and investment properties for the last 20 years. The indicative market value of the land held for development is RM720mil while the land held as investment properties are valued at RM384mil, as appraised by independent professional valuers, CH William, Knight Frank, CBRE and Rahim & Co.
“While its true that not all of the assets purchased are earnings accretive apart from the investment properties, the new landbank makes them a lot bigger and streamlines the whole group. Size-wise, Dijaya has grown quite significantly,” said the analyst. Meanwhile, for long-term capital requirements of the group, Dijaya proposed a debt funding via the issuance of up to RM500mil guaranteed commercial paper/medium term notes programme (CP/MTN) with an option to issue detachable warrants. RHB Bank Bhd and AmBank Bhd are the guarantor banks and RHB Investment Bank Bhd and AmInvestment Bank Bhd are the appointed joint lead arrangers and joint lead managers for the proposed CP/MTN programme. Astramina Advisory is the appointed financial adviser for the proposed CP/MTN programme. Dijaya would abort its proposed private placement that was previously announced on Aug 18 2011. According to Dijaya's announcement to Bursa, the proposed acquisitions are aimed at amalgamating the group's assets with those held by the major shareholders which would ultimately mitigate potential conflict of business interests between Dijaya and its major shareholders whilst at the same time help transform it into a single real estate flagship with greater access to larger landbank for future developments and long-term real estate investments as well as greater economies-of-scale. “The introduction of additional long-term real estate investments will provide the group with a more stable and sustainable income streams arising from rental income,” said Dijaya in its announcement. Astramina Advisory, RHB Investment Bank and AmInvestment Bank have been appointed as the joint advisers for Dijaya for the amalgamation exercise. SINGAPORE: When the news broke last Friday that second-time buyers of public housing units would be given more chances to purchase executive condominium (EC) units, Eddie Luo, 37, was elated. The engineer and his wife were seeking to move their two children and his father from their five-room flat in Sengkang, and had failed to get a unit at Twin Waterfalls in Punggol on their first try. They are happy now that they have landed themselves a unit. Luo was among the many who thronged the Punggol showroom on Sunday, following the announcement of a revised quota of flats for second-timers namely those who have previously enjoyed a housing subsidy from the government. From 5% previously, 30% of units in ECs will now be set aside for this class of house hunters. 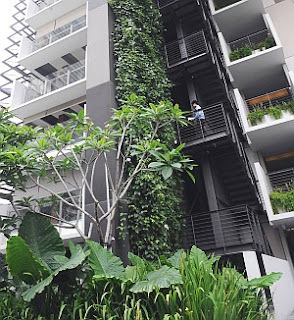 ECs are sold by private developers with condominium-like facilities, but come with conditions set by the Housing Board, such as a five-year minimum occupancy period. Its spokesman, Elson Poo, said the strong demand was a testament to the attractive pricing of the project, which is going for S$698 per sq ft (psf). About 300 units, which go for S$766 psf, have been sold. Ultimately, the demand boiled down to price as well as the quota, said SLP International's head of research Nicholas Mak. “The higher the price goes, the more skewed towards second-timers the number will be, because first-timers may not be able to afford the more expensive developments,” he said. Based on Mak's data, the psf prices of ECs when they were launched in 1996 was about S$400; EC units now go from about S$700 to S$750 psf. Nearby private condominium units are fetching S$820 to S$950 psf for comparable flat types. On the other end of the scale, a larger BTO flat will cost S$250 to S$350 psf, and a resale flat, S$380 to S$550 psf. “If second-timers continue to go for ECs, it may be feasible to revise the quota even further,” said Mak. Poo agreed. Based on the sales at Twin Waterfalls, the 30% allocated to second-timers have already been taken up. Of the 70% reserved for first-timers, slightly less than half have been taken up. “The government has responded to ground sentiment. But it could still be frustrating for the second-time buyer, who may have a stronger financial base but do not have the chance to buy EC units,” he said. Colin Tan, the research head at Chesterton Suntec International, said such demand might continue, since second-timers felt they had a real chance at getting a choice unit now. As a rule, the ratio of first- and second-timers are observed only within the first month of a project's launch. After that, any eligible house hunter may buy, although the less-desirable units may be left by then. Tan said he did not expect the quota to make a big impact on the market due to the small quantities, unless the government sold more land for ECs. The Kuala Lumpur City Hall (DBKL) will have to fork out RM135mil to acquire the land if it did not want the proposed development in Bukit Gasing. Mayor Tan Sri Ahmad Fuad Ismail said according to Federal Territory (Planning) Act 1982 (Act 267) Section 25, the developer could claim compensation if DBKL cancelled the approval for the development. He said this in response to the gathering by about 100 people on Sunday who were concerned about the development on the Kuala Lumpur side of the hill. The residents had applied for a judicial review in the High Court in 2008 challenging DBKL’s approval of the development. The High Court had made its decision on Sept 6, 2010 and the residents were denied the right to be heard. The residents appealed against the decision in the Court of Appeal yesterday but it was unsuccessful. “Even before the inception of Federal Territory of Kuala Lumpur, the land had already been zoned for housing by the Selangor town and country planning department. “Therefore, there is no issue about land usage when we received the proposal for development. “On the other side, there is already a high-density condominium project while the proposed one in Kuala Lumpur only has 71 bungalows. “The earthwork being carried out at the site is being monitored by the Public Works Institute of Malaysia (Ikram). “DBKL has 52.6ha of green lung compared with only 36.42ha for Selangor and we have added another 6ha more, so how can they question our commitment?” he asked. He added that the application for the green lung to be gazetted had already been submitted to the land office. “The land use and zoning are also in our structure plan. The Lembah Pantai MP Nurul Izzah has been informed about the proposed development and discussions had been held with the residents. “There wasn’t any public hearing because the land title was not changed and our approval was based on the compliance of the terms for development,” he said. SINGAPORE: The Housing Board has decided to go ahead with its original plans to build 130 units of studio apartments for the elderly at the junction between Toh Yi Drive and Toh Yi Road. This decision comes a month after residents there submitted a petition to their Member of Parliament, Sim Ann, in a bid to oppose plans. The Housing Board said that the site was the only one available in the estate suitable to build the studio apartments. However, it said that it had addressed the residents' concerns of losing the estate's main recreational facility by incorporating a children's playground, elderly fitness corner and community garden. The Housing Board also explained that the other alternative sites suggested by the residents were not feasible.